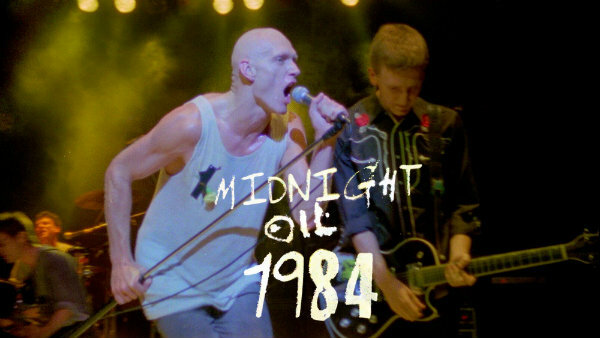 The new documentary chronicling Midnight Oil’s pivotal year of 1984 — which saw the release of Red Sails in the Sunset and Peter Garrett’s failed run for the Australian Senate as a Nuclear Disarmament Party candidate — will screen later next month in select U.S. theaters. The film, “Midnight Oil 1984,” features vintage concert footage and new interviews, and will screen in select U.S. theaters, primarily on the evening of Aug. 29. See current screening dates below, and keep an eye on this map for any additional screenings that might be added in the coming weeks. The documentary already has shown oversees, and has been released on DVD in Australia, although be warned that it won’t necessarily play on region-coded DVD players. Check out the screening dates, and watch the trailer, below. Love that the Oils have been back in the spotlight of late. Would love to get a new studio album, but they seem to be doing everything besides that. I don’t know how long it takes you to write and release an album, but it takes a bit of time when you’re out on tour getting people excited for your return. Drummer/songwriter Rob Hirst has said publicly that he doesn’t want the reunited band to simply be a nostalgia act and that his participation was on the basis that new songs should be recorded with an eye on releasing a new studio album. Please buy tickets to these shows or they won’t screen it, it’s on demand only so get to it! Bay Area people please buy tickets for the Oakland show, we still need 39 but let’s sell out the whole thing and ROCK!!! Believe me, if it was playing anywhere near me I’d be the first in line. Looks like the DVD is being released in the U.S. on August 3. There seems to be some conflicting information. That site shows it as a region free DVD while Amazon shows it as a region 4 (Australia) DVD and Barnes and Noble lists no information about its region. Just saw this doc yesterday on a Qantas flight from Sydney back to Canada. Wow!!! Just blown away. Did this ever bring me back to 1984 and being in my last year of High School in Sydney. Would love to see it on a big screen (alas nothing listed in Toronto) – if you live near anywhere this is showing, you won’t be disappointed. The DVD I bought a few weeks ago in Melbourne (released by MADMAN) is a Region 4 disc for Australia only. It’s a fantastic treasure trove of footage with lots of never before seen stuff showing the dynamic young band in full sweat-soaked flight. Freakin’ awesome film!!! Brought back a lot of great memories of seeing the band back in the day. I saw one of their reunion shows recently – they still cut it, so if you get the chance…. Thanks for confirming the region 4 info!